ON a side street in Park Slope,Brooklyn, Austin Horse cobbled together an impromptu podium last weekend out of a plastic milk crate and a case of Red Bull. 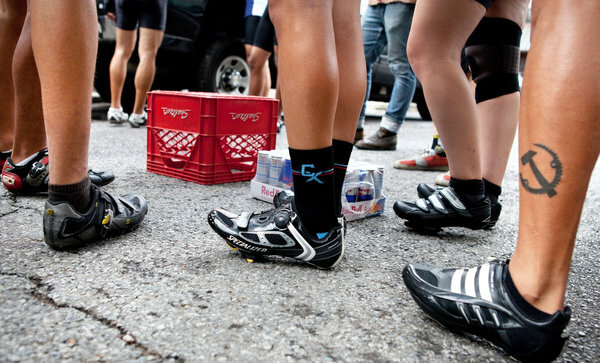 The scene, more reminiscent of a garage-band festival than a bicycle event, captured the spirit of the East Coast Messenger Stage Race, Mr. Horse’s hastily arranged, informal competition for a small group of hardy riders — mostly bicycle messengers — from across the country. The five-day race, through a tangled network of roads from Boston to Washington, was the latest project for Mr. Horse, a competitive cyclist and bike advocate who has emerged in recent years as one of the best-known figures in the city’s brigade of professional messengers. Mr. Horse, 29, has raced against a sport utility vehicle from Harlem to Brooklynin a Web advertisement for Mercedes-Benz, worked as a producer and cameraman on a reality series about bicycle messengers for the Travel Channel and performed stunts for more than two months for “Premium Rush,” a bike-centered action movie to be released next year. He has won national and international messenger competitions, as well as sponsorship deals with Red Bull, Oakley sunglasses and the urban bike-wear company Outlier. But there is a paradox at work here: just as corporate brands andHollywoodtry to harness the increasing visibility of urban cycling through its most recognizable character, the grease-grizzledNew York Citymessenger, that subculture is dwindling in the face of higher-tech competition.